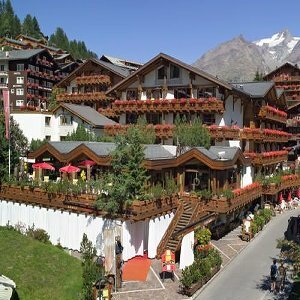 Nestled in the heart of Upper Valais, the glacier village of Saas-Fee has for decades served as the gateway to arguably Switzerland’s most beautiful region. And, whatever season you choose to visit, the five-star Ferienart offers a true taste of luxury in the midst of spectacular scenery. In the winter, it welcomes skiers and snowboarders keen to challenge themselves on the alpine slopes as well mountaineers looking to take on a tough ice climb. During the spring and summer months, meanwhile, the luxury hotel welcomes walkers, wildlife watchers and families looking for a break from everyday life, while also regularly playing host to wedding parties and other celebrations. But whatever time of the year you visit, you are guaranteed to be completely indulged. The Ferien Art boasts its own fitness and wellbeing centre, complete with the huge ‘Paradise Spa’, indoor swimming pool, scented steam baths and saunas. Plus, to add to the feeling of complete and utter relaxation, the spa’s large windows look out onto the stunning scenery that surrounds the hotel, including the landscaped gardens and, of course, the snow-capped mountaintops. Upstairs, meanwhile, guests are treated to sumptuous accommodation, with all rooms and suites modelled around the ‘Alpine Chic’ philosophy. The generously-proportioned bedrooms are decorated with plenty of rustic wood, lending a traditional but contemporary feel to the accommodation, plus all are equipped with balconies offering mountain views. For guests really wanting to indulge themselves, then the hotel’s luxury Alpine Suites come equipped with full fire places, large bath tubs and separate living rooms, offering a cosy home away from home in the heart of the Swiss Alps. Complementing the unrivalled luxury accommodation and the state-of-the-art spa facilities, the Feiren Art Hotel also boasts not one, but three world-class restaurants guaranteed to satisfy even the most demanding gourmand. Here, warmed by real fires and taking in views of the glacial valley surrounding them, guests can enjoy the very best of Swiss cuisine. All of the ingredients are sourced locally, with the in-house team of expert chefs giving contemporary twists to classic dishes. Additionally, the Del Ponte restaurant offers hearty Italian fare, including hearty hot pasta dishes and pizzas – ideal after a long day on the slopes or exploring the region on foot!